Released in 1989, the Famicom Titler truly is an odd little offering. It's a licensed Nintendo Famicom compatible console by Sharp, sporting both a S-Video output and the surreal ability to actually add subtitles to your games. Apparently you could even record small demos too, as the Titler came with a microphone and stylus to further enhance its video editing capabilities. Anyway, you can find out more here. 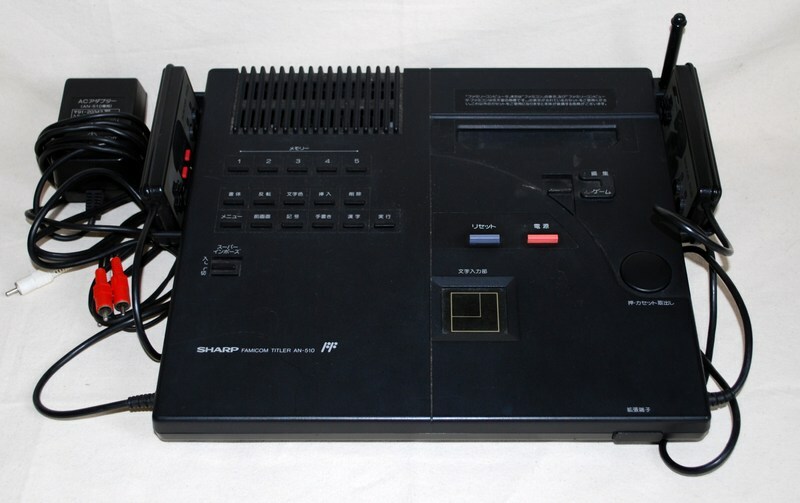 What you now need to know is that the Famicom Titler is a rare and thus expensive system, and you can try and own an unboxed one via this Sharp Famicom Titler AN-510 eBay auction. Seller ships worldwide. Wow...just when I thought I'd seen every rare Famicom variant...here's one that I never expected! This thing is nuts! Absolutely brilliantly odd. BTW, fantastic site you got there GamesOgre.